Man Math grew up in Kampong Chhnang, a province located right at the heart of Cambodia, on the banks of the Tonle Sap River. Coming from a poor family, Man did not have the means to go to university. Fortunately, Passerelles Numériques Cambodia (PNC) gave him a scholarship to go to their university in Phnom Penh, as part of their work to help disadvantaged Cambodians access training and find jobs in information technology. “Every year PNC offers scholarships to poor students in 19 provinces,” Man explains. 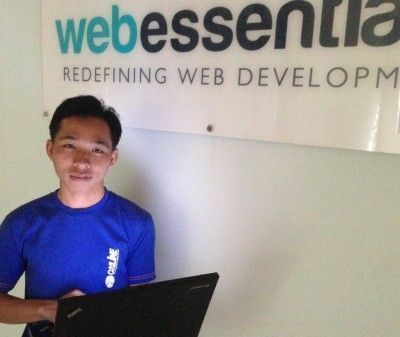 Man worked hard at university and is now a Web Developer at Web Essentials. He also remains actively involved with PNC as the Project Coordinator for the PNC Alumni Association. Man is only one of many bright and hardworking staff Web Essentials has recruited from PNC. Every year, between six and ten interns from PNC complete paid internships at Web Essentials. SamAth Im, Human Resources and Administration Manager at Web Essentials, explains why Web Essentials chose to work with PNC. Interns spend a month learning about TYPO3 before developing a test project. If they later apply and become staff at Web Essentials, they become members of an Agile Development team. Most interns want to stay with Web Essentials after their internships and their studies are over. Man has now worked at Web Essentials for two years, in which time he’s learned a lot about web development, TYPO3 and other web technologies and has grown close to his scrum team.